I’ve been sewing a lot in 2014 so far and I’ve really noticed an improvement in my piecing accuracy with the extra practise I’ve been getting in. In particular, I think all the mini quilt making and Farmer's Wife Quilt blocks I've done recently has really helped as I’ve been working with such tiny pieces! It’s always an on-going goal for me to improve my piecing and I’ve been working hard to get the best results. So this is not a definitive list from a quilting god here - more of a basic guide with some helpful tips that I have picked up in my years of quilting and what I try to remember each time I work on a quilting project. 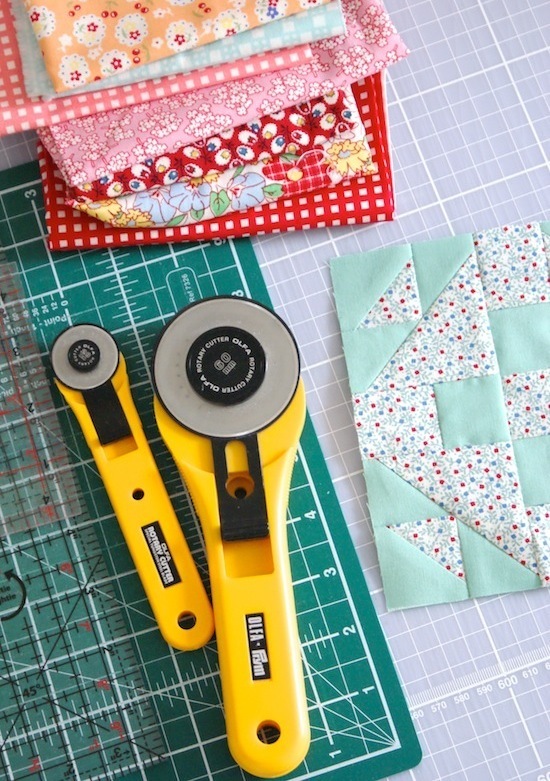 First off, it may sound obvious – but is there enough light where you are cutting and sewing? I added in two Ikea Jansjo spotlights over my desk last year and it made a world of difference for me as I usually sew in the evenings, and just one ceiling bulb wasn’t cutting it. I have one directly over my sewing machine, and the other one arched over the desk area to help me with rotary cutting. Accurate cutting is the first step in getting the most precise results, so for me I like to press my fabric before I do any cutting and ensure the fabric is squared up correctly ready for rotary cutting. For really tiny piecing projects, I’ve heard spray starching fabric is a good idea, though I’ve not tried this yet myself. Though I would starch before you cut as starching afterwards may shrink the fabric. The right tool for the right project. The larger 60mm rotary cutters are ideal for cutting large pieces of fabric down to manageable strips, whereas the smaller 28mm cutters are perfect for tiny piecing. So remember to switch it up as you're working, it helps not using a big cumbersome rotary cutter for a tiny 6" block, for example! Use your rotary cutter consistently; what I mean by that is: for me I line up my fabric and acrylic ruler so the lines are exactly on the inside of the fabric, as the lines can sometimes be quite thick. It’s only a whisker of difference but sometimes if you switch methods between a project it can make a difference. Am I sitting straight in front of my machine? The needle, more specifically. If you’re sitting at a slight angle it could affect your measurements. It goes without saying that an accurate ¼” seam allowance is essential for patchwork and quilting. 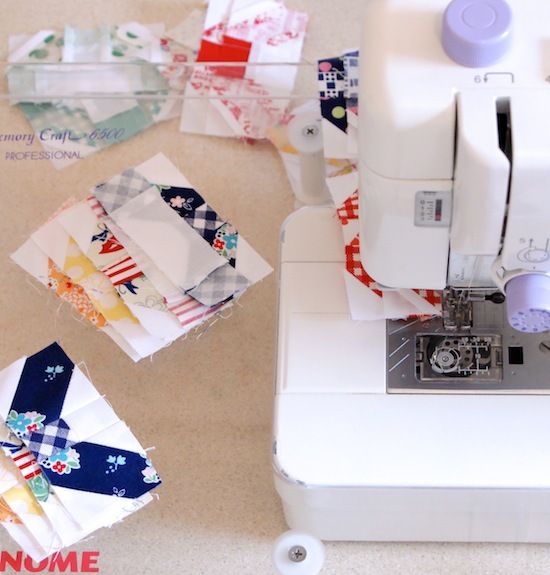 Personally, I like to use a ¼” foot on my Janome as I think it gives me more accurate results than the regular foot. I found this really great exercise here to make sure you get the perfect 1/4" seam. I love to chain piece and I use it more and more these days, an important thing I’ve learnt more recently to help with chain piecing smaller units is to use a small scrap of fabric as a leader and ender. It really helps to keep the accurate ¼” seam at either ends where it can sometimes get a little troublesome. Or sometimes with larger completed blocks I tend to stitch just inwards of the block slightly, instead of using a leader and ender scrap. Go slowly. This is one I really repeat to myself often. A lot of times I give myself a time-frame to sew, or set myself unrealistic goals to ‘finish before bed’, so I end up rushing and making mistakes which ends up taking me double the time in first place! It's a process of enjoyment, not a race. Pressing is definitely an area I have improved in. I have learned to not to press like I’m ironing a shirt – pushing all over the place and distorting the fabric. Instead setting the iron flat on top of the piece to press. With smaller HST units etc. I lightly finger press my seams first and only use the iron to press downwards. For larger completed blocks, I use a gliding motion carefully – on the front (printed side of the fabric) as well as pressing flat. I use a dry iron, no steam. For my seams to line up perfectly I pin diagonally through the pieces at intersecting seams. I love using nesting seams (pressing seams in opposite directions, so that when the two units are sewn together, they 'nest together') where I can! Great tips. The more I patch the better I get so there is a lot of truth in 'practise makes perfect'. Love your sewing area set-up. Those Ikea hanging rails are a great idea. When I got my Janome it came with the 1/4" foot and I LOVE it. It truly makes a world of difference. Highly recommended! I have a bad habit of finger pressing and hardly using the iron. I really need to work on that. Thanks for the great tips! I never would have thought about your body not being straight on would have an effect...but that is so obvious, one of those DOH moments! Great tips! Thank you! Thnank for the great tips! i sldo pin it! Starch is my best friend! I always use it before I cut. Great list of tips!!! Amei seu cantinho de trabalho ! tudo lindo ,colorido e alegre muito legal. Ooo, thank you for these tips... they will be handy when I finally, finally start my first quilt! Great tips. I am just finding out how much I have learned in two years. I'm getting ready to sash some blocks I made when I first learned how to piece blocks. I've been smiling to myself at my beginner blocks and realizing how much I've learned in just two years! And I am loving that spotlight! I definitely need that over my cutting table, and it's small enough to fit! Muchas gracias por tu interés en mejorar la técnica de empalmes. Grandes trucos que habrá que aplicar!